Rapper Ja Rule was paroled from prison earlier this year after spending a couple of years behind bars for a weapons violation and tax evasion. In a case of art imitating life, he now stars in a faith-based tale of redemption revolving around a hip-hop producer endeavoring to go straight following his release from jail. 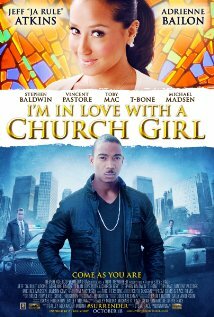 I'm in Love with a Church Girl was actually inspired by a true story, but not Ja Rule’s. Rather, the autobiographical screenplay was penned by convicted coke dealer-turned-preacher Galley Molina while incarcerated in a California penitentiary. The movie is set in the San Jose native’s hometown where the ex-gangsta now serves as youth pastor at the Evergreen Valley Church. Narrated by Ja, the picture’s protagonist is a fictional character called Miles Montego. As the flashback flick unfolds, we find Miles returning to the ‘hood after a stint in the slammer. He immediately gets a good piece of advice from his Bible-thumping mom (Marjorie Mann), namely, to attend services on Sunday in order to meet a good God-fearing woman who might help keep his nose clean. Sure enough, he soon falls in love at first sight with Vanessa (Adrienne Bailon), a clerk at a store specializing in Christian-oriented products. The two hit it off, despite her concern about all the bling and his degenerate-looking posse. Eventually, Vanessa becomes convinced that he’s left the life of crime behind, but the same can’t be said about the DEA Agent (Stephen Baldwin) still tailing Miles him with hopes of arresting him again. Given the film’s spoiler of a title, there’s a sense of inevitably about I'm in Love with a Church Girl. 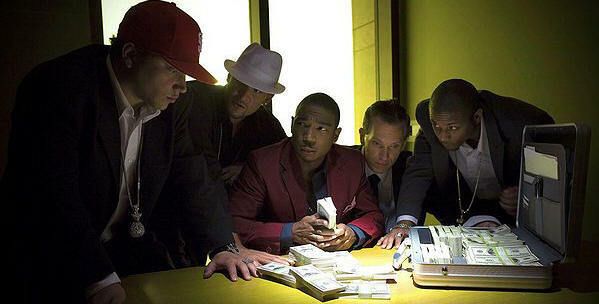 This easy to predict morality play is certain to resonate with the Evangelical demographic, and it even has a chance of attracting a mainstream audience because of the presence of the charismatic Ja Rule in the lead role. A faith-based modern parable with a positive message for both believers and wayward souls ripe for redemption.